Shipping: Shipping: This product ships in multiple boxes, which the website cannot figure into the shipping charge. Therefore, a $50 handling fee will be added to all plow orders to help cover the shipping on the multiple boxes you will receive. All parts are laser cut to ensure a perfect fit, then MIG welded. Plow blade is 20" high and 72" wide. Plow frame is made from 1/4" and 3/8" thick steel. Plow raises and lowers with your winch. EMP now offers rubber blades as an option, but please call to order. 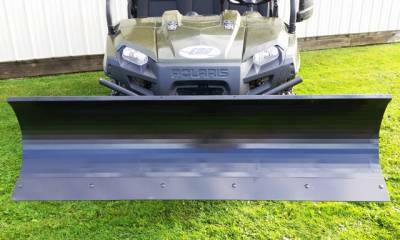 Plow blades are 20" high (higher than others) and 72" wide. The mold boards are made from 14 gauge steel and have 1/4" thick laser cut braces. They feature manual angle adjustment (left, right, center positions) or an optional electric over hydraulic power angle (sold separately, see Power Angle). Our wear blade is made from AR plate (Abrasion Resistant Steel) and is 4" high. Others on the market are much thinner and shorter, wearing out much sooner. 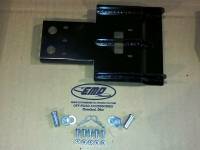 EMP plow frames are laser cut from 1/4" and 3/8" thick steel. The parts fabricated with the tab and slot method. In other words, the parts fit together like a puzzle before welding. This ensures a perfect fit every time. 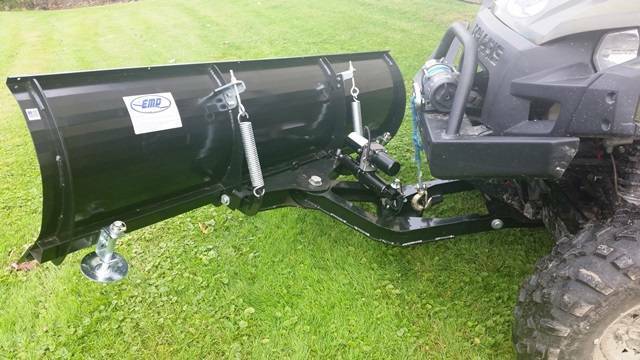 Our plow mounting system mounts to the front and underside of the UTV with the supplied hardware. 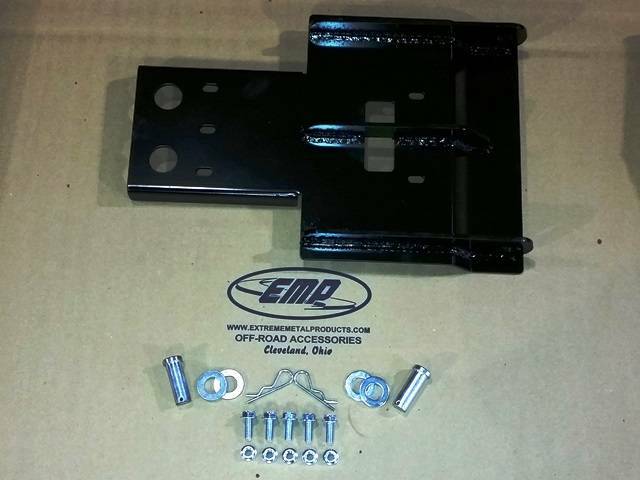 The mount can easily be removed at the end of the season with six bolts. 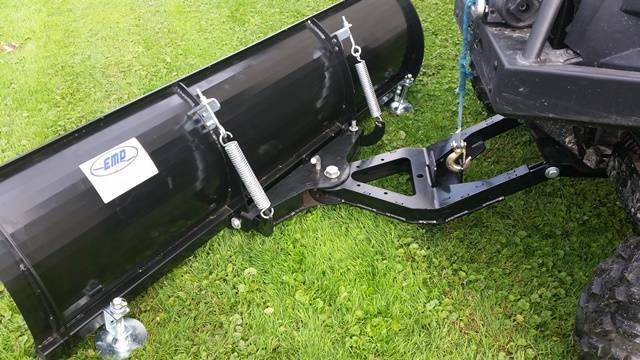 The plow attaches in less than a minute with the supplied hitch pins. This assembly does not include a winch mount. If you need one, please see #10526. 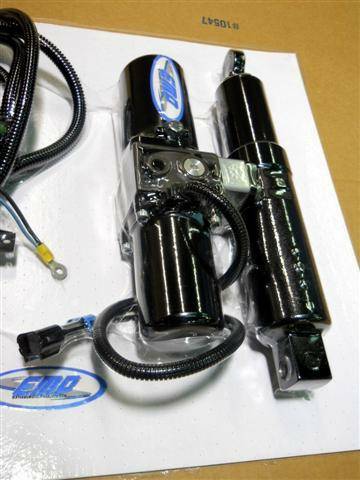 It is also pictured in some pictures with our Optional Electric/Hydraulic Power Angle that is not included. Shipping Remarks: Shipping: This product ships in multiple boxes, which the website cannot figure into the shipping charge. Therefore, a $50 handling fee will be added to all plow orders to help cover the shipping on the multiple boxes you will receive.